Please read these terms and conditions carefully before placing your order and retain a copy of these terms and your order for future reference. Please also read our Privacy Statement, which contains important information about how we record and manage your data. These terms and conditions will apply to all transactions placed online, by e-mail, telephone or by post with Tap2Tag Limited. Please read them carefully before placing any order. All contracts shall be governed by and construed in accordance with English Law and any dispute between us will be resolved exclusively in the courts of England and Wales. Nothing in these terms and conditions will be deemed to affect your statutory rights. By using this site you are agreeing to these terms and conditions and all transactions with Tap2Tag Limited will be governed thereby. All references to the ‘company’, ‘us’, or ‘we’ will refer to Tap2Tag Limited. All references to ‘the customer’ or ‘you’ shall mean the person or persons purchasing or agreeing to purchase goods or services from the company. You acknowledge that information contained within your profiles may become visible and available to persons known and unknown by you. You also accept that information that you add to profiles that are not your own are your responsibility and Tap2Tag Limited cannot be held responsible for any omissions or errors made. You also acknowledge that you have the right to publish this information on behalf of other individuals. Our main website at www.tap2tag.me show prices in pound sterling (£) and are inclusive of UK VAT at the current rate unless clearly stated otherwise. In some cases, we will have products for sale on our Affiliated websites in other currencies including Canadian and US Dollars. These prices are shown NET of any applicable local taxes. Taxes, where applicable, will be added in the Shopping Cart. If this is the case you can make payments on your debit or credit card in these currencies, but only where clearly shown. We are pleased to accept orders by online transaction (secure server). Any order placed by you for goods or services advertised on our website is an offer by you to purchase the goods selected in your order. No contract exists between you and us for the sale of any goods until we accept it (which we may do at our discretion). We will send you an email acknowledgment to confirm your order has been received. This acknowledgement is not notification that we have accepted your order. At any time, you can obtain the status of your order by emailing support@tap2tag.me with a request. Be sure to include your order reference number, if you have it. If we accept your order we will notify you by email prior to despatch of the goods. If we cannot accept your order we will notify you by email. If in the event that, after we accept your order, we discover that the goods are unavailable or that there was a pricing error on our website in respect of the goods ordered, we reserve the right not to supply the goods ordered and offer you a refund or alternative product. Payment for the goods and delivery charges can be made by any method shown on our website at the time the order is placed. Payment shall be due before the delivery date and time. Non-payment of an order will result in its cancellation. All credit/debit card transactions are subject to validation checks and are authorised by the card issuer. We accept MasterCard, American Express, Visa, Electron, Delta, Maestro, Solo and PayPal. If the issuer of your card refuses to authorise payment to us, we will not be liable for any delay and / or non-delivery of your order. No orders for immediate despatch will be accepted or processed without a valid card payment in the name of the registered cardholder. Payments shall be made by you without any deduction whatsoever unless you have a valid court order requiring an amount equal to such deduction to be paid to us. Items ordered will be delivered as soon as possible, dispatch targeted within one working day of the order being placed unless otherwise notified. Every effort is made to ensure that delivery is made within the estimated time scales and a maximum of twenty-eight days. All goods are subject to availability. In the event that we are unable to supply your goods within twenty-eight days, we will inform you immediately and advise you of the expected delivery date. All shipments are made by Royal Mail or Canadian Mail. In the event of any goods delivered by us being damaged in transit, deficient of items shown on the delivery note or failing to match the items ordered by you, then such details must be notified by you to us within three working days of the receipt. If no such notification the customer will be deemed to have accepted the items as satisfactory. We cannot be held responsible for any consequential loss caused by late delivery or failure to deliver by the company’s appointed carrier. Liability in such cases is limited to the value of those items, which are shown to have not been received by the customer. store the goods until actual delivery and charge you for reasonable costs (including insurance) of storage. If you fail to take delivery because you have cancelled your contract under the Distance Selling Regulations we shall refund or re-credit you within 30 days for any sum that has been paid by you or debited from your credit card for the goods. On exercising your right to cancel you shall be required to return the goods to us. Should you fail to return the goods, we reserve the right to deduct any direct costs incurred by us in retrieving the goods as a result of such failure. Under the United Kingdom's Consumer Protection (Distance Selling) Regulations 2000 you as consumer have the right to cancel the contract for the purchase of any item within seven working days of delivery within reason. These include and are not limited to the setup, action, feel, build quality and sound of a product. If you wish to return any item please email returns@tap2tag.me to receive a returns number within your 7 day contractual period with details of why you wish to return your product. Once you have your returns number you can send the item back to us yourself or our courier can collect the item(s) and return them to us at a cost of £9.99. A £5 administration charge for this service will be charged. If the goods supplied to you are faulty or incomplete on arrival (whether or not they were damaged in transit), you must notify us within 7 working days of receipt of the goods and return the goods to us in accordance with our returns policy. Once we have verified the fault with your product within the applicable guarantee period (normally 12 months from delivery) we will normally offer a prompt repair service. If the fault occurs within 28 days of purchase you will always have the option of exchange, refund* or credit (*with proof of purchase). This does not affect your statutory rights. If you consider your product faulty and would like an exchange, refund or credit please follow our returns procedure. NB: Claims relating to setups quality or value for money are not considered faults if you wish to return something for these or similar reasons please see 6.a. Any items that you return to us are at your own risk, therefore we strongly advise all our customers to take reasonable care when returning any items to us for example, by ensuring the goods are correctly addressed, adequately packaged, and carried by a reputable carrier. We recommend that all items returned to us be sent recorded delivery with insurance paid as a minimum. Your local Post Office will be able to advise you. Please note that any items returned to us that you claim to be faulty or incomplete are checked and verified by our technicians. Any returned items that are found not to be faulty or incomplete will be returned to you and we shall be entitled to charge you for the return carriage costs via your original payment method. In the event that your credit card has expired or is declined we will hold the item(s) until full payment has been made for the return carriage. You have the right to cancel the contract at any time up to 7 working days. To exercise your right of cancellation, you must give written notice to us by hand, post or email, giving details of the goods ordered and (where appropriate) their delivery. Notification by phone is not sufficient. Except in the case of faulty or mis-described goods, if you exercise your right of cancellation after the goods have been delivered to you, you will be responsible for returning the goods to us at your own cost. The goods must be returned to the address shown within the returns section of our website. You must take reasonable care to ensure the goods are not damaged in the meantime or in transit. In the case of faulty or mis-described goods we shall, after receiving notification in accordance with condition 7.4 or 7.5, either collect the goods from you or ask you to return the goods to us in accordance with our Returns procedure. Tap2Tag medical alert devices are designed to provide assistance to first responders, paramedics and medically trained personnel. The user accepts that Tap2Tag cannot be held responsible for the failure of their devices in the event of an emergency that way result in harm to the wearer including death. Tap2Tag are not responsible for the data held on its website and it is the responsibility of the user to ensure that this information is up-to-date and relevant to the wearer/owner of the device. Tap2Tag is not responsible for any network failure that means that the website cannot be accessed or that a user uses a mobile device to access the website that is not compatible with the technology. Tap2Tag tries to ensure that its service is provided in a continuous manner but, from time to time, the system may be taken down for essential maintenance or for other reasons outside of its control. Tap2Tag do not accept any liability for its service being down when a user is trying to access medical information. Please identify clearly the area or part that has failed. All items must be returned in their original condition as sent. Please also refer to 6c of our returns policy. All products shown on the www.tap2tag.me website are shown in UK Sterling. Payments by debit or credit card will be made in the currency displayed and exchange differences relating to the currency relating to your payment card will be calculated by your card provider. Some products and services may be reported in other currencies such as Canadian Dollars or US Dollars. These will be specific to products and services for other countries where these currencies are relevant. Where such products and services are displayed in currencies other than UK Sterling you may make payment using your card in those currencies. We endeavour to ensure that our products meet local restrictions for the importation of goods. As such we will restrict the sale of products and services to such countries. All Items supplied to the customer remain the property of Tap2Tag Limited until final payment of all sums owing in respect of those goods has been received in full by us. Any complaint can be sent to the address above in section 10. Alternatively, you may contact support@tap2tag.me. We will endeavour to deal with your complaint as soon as is possible. In the event where we cannot resolve your complaint immediately, we will advise a likely timescale to you and keep you informed of any investigation. Office Opening Hours may vary depending on season and location. 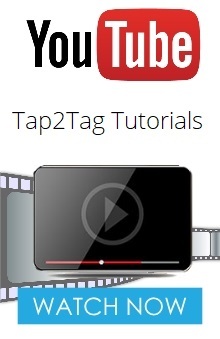 The contents of this site and other publications from Tap2Tag Limited are owned or are used with permission by the owner. Reproduction strictly by permission only.